Here's my entry for Ruby Tuesday, a super delicious fruits such as strawberry, grapes, pineapple and many more. I know all of you will love these and me too. So, just for your eyes only or just open your fridge and eat your fruits there, hehehe. Oh..wow! You made me want to grab something in the fridge now! :) Nice choice,Norm! That's some yummy looking fruit! The strawberries got my attention! Fresh fruit in its entirety...not just the ripe strawberries (perfect for RT of course) but the pineapple, grapes and berries are superb not just for nutrition...bur great looks, too! Wonderful-looking platter. I want a bite of those strawberries. 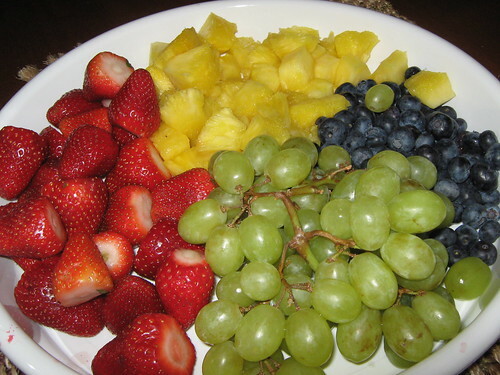 What a beautiful plate of fruit! Yummy! Nice presentation of a plate of fruit. It made me want some. Thanks for sharing. That actually made my mouth water! Great photo. Have a wonderful RT. Wow! So colorful and the strawberries are the perfect shade of ruby red! Totally awesome, I open this up and I am sitting here eating my usual fresh fruit brkfst thinking yours looks better than mine! great color contrast they all support each other wonderfully. Now that's a healthy (and eye-pleasing) snack!